For ease of framing your artwork we offer our prints fully mounted ready to be placed straight into a frame of your choice. We recommend you use a frame to display your artwork, it serves two purposes, to visually enhance the artwork and to offer a level of protection from airborne pollution and acid damage. The white core mount boards we use feature a pure white core and offer a clean, crisp bevel cut. Each board is lignin free, alkaline sized, pH neutral and is calcium carbonate buffered to enhance its useful lifespan by minimising the effect of atmospheric pollutants. It is at the Commended level of the Fine Art Guild standards. 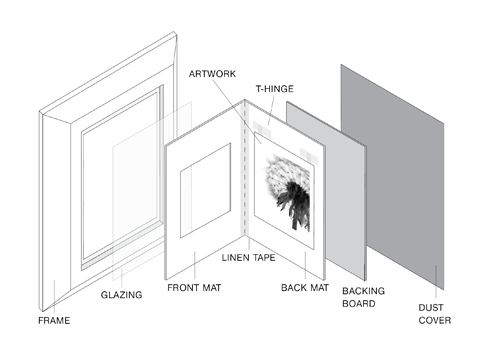 The diagram below shows the different components involved in framing a piece of art. The mount consists of a front mat and a back mat, the front mat is the window the artwork sits behind. The back mat is a backing board which the artwork is hinged to. We use the same type of mount board for the front and back mat. This provides a higher quality mount for your artwork. The diagram below, drawn to scale, gives you an idea of how your mounted artwork would appear and shows the different size options available. The mounted artwork comes in metric sizes designed to fit standard sized frames that are readily available. Bespoke framing can be expensive so this helps keep costs down and allows for quick efficient framing.